In addition to permanent public art, we create temporary installations for all to enjoy. ArtWorks Youth Apprentices and Professional Artists transformed 24+ cars, trucks and vans into mobile masterpieces. You can still see some on the road today! 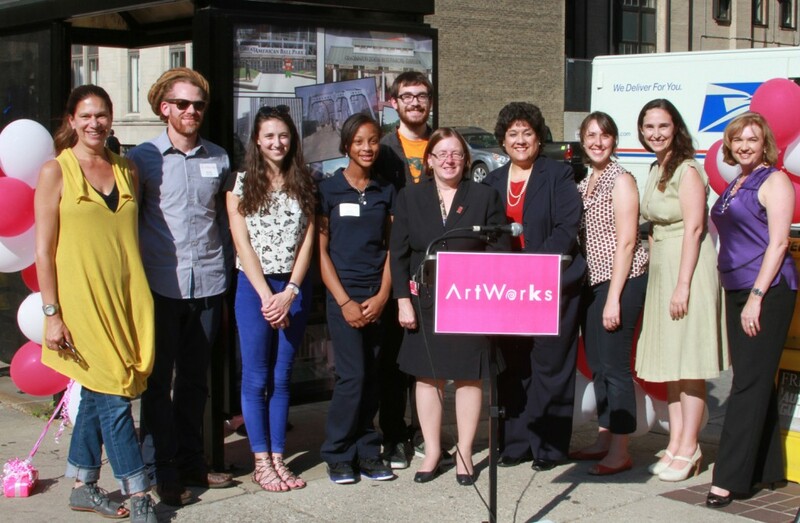 In summer 2013, ArtWorks partnered with Metro and The Public Library of Cincinnati and Hamilton County to beautify 24 downtown bus shelters with art inspired by works of literature. For FotoFocus 2014, ArtWorks partnered with Cincinnati Metro and invited renowned photographer Richard Renaldi to produce a unique extension of his existing project “Touching Strangers” in Cincinnati. In this project, Renaldi invited complete strangers to come together and pose, intimately, in ways that people are usually taught to reserve for their close friends, a real couple, or family. Renaldi created spontaneous and fleeting relationships between strangers for the camera, often pushing his subjects beyond their comfort levels. These relationships may only last for the moment the shutter is released, but the resulting photographs are moving and provocative, and raise profound questions about the possibilities for positive human connection in a diverse society. ArtWorks hired four youth Apprentices and two local professional photographers to aid Renaldi in the project execution and produce Touching Strangers portraits independently as well. The photographs were housed in 60 bus shelters across the City of Cincinnati, 400 transit cards inside Metro buses, and one image was turned in to a vinyl bus wrap for six months. Since 2007, Richard Renaldi has been working on a series of photographs that involve approaching and asking complete strangers to physically interact while posing together for a portrait. Working on the street with a large format 8-by-10-inch view camera, Renaldi encounters the subjects for his photographs in towns and cities all over the United States. He pairs them up and invites them to pose together, intimately, in ways that people are usually taught to reserve for their close friends and loved ones. Renaldi creates spontaneous and fleeting relationships between strangers for the camera, often pushing his subjects beyond their comfort levels. These relationships may only last for the moment the shutter is released, but the resulting photographs are moving and provocative, and raise profound questions about the possibilities for positive human connection in a diverse society. Life Theater is a performance art piece which combines the spontaneous world in which we live with the planned world of theater. What seem to be everyday activities to unsuspecting onlookers are actually thought out, planned performances by ArtWorks artists. 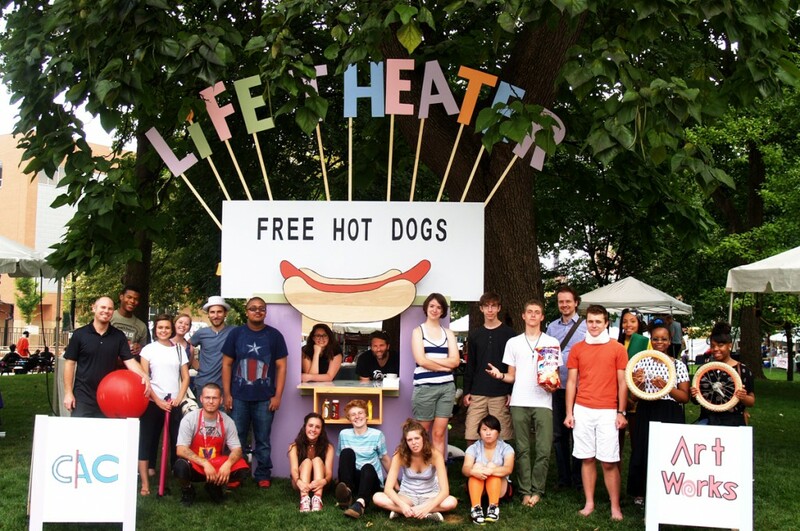 Life Theater was a temporary project that took place over the course of 5 days during the summer of 2014. The widely celebrated experiential artist Lee Walton lead 8 ArtWorks Apprentices to complete this temporary piece. The team made several appearances at various parks throughout the city including: Washington Park, Owl’s Nest Park, and Ault Park. Lee Walton has performed Life Theater in several cities around the country. For this particular variation, Apprentices gave away free hot dogs with wrappers containing phrases describing people and actions. As customers received the hot dogs and read the phrases, Apprentices acted out the very descriptions being read. At the start of the project, the Apprentices constructed and painted the vibrant Life Theater storefront. Then, the team prepared the hot dog wrappers by stamping them with events such as, “Boy with red ball is lost” that the Apprentices were to act out as the customer read it. Once all the preparations were completed, the team set up the hot dog stand at three different parks in Cincinnati and the performance began. As customers enjoyed the free hot dogs they began to notice that seemingly ordinary people in the park were actually ArtWorks artists performing specific actions! The most successful appearance was during Lumenocity at Washington Park, the team was constantly stamping the hot dog wrappers with the events, and had a continuous line for the free hot dogs. C A M P G R O U N D was the first installation of temporary works of art installed on the west-facing façade of the French wing of the Cincinnati Art Museum. ArtWorks CincyInk was an interactive, citywide celebration of love for Cincinnati, manifesting itself in the form of poems, tattoos and urban art installations. FotoFocus is a Cincinnati-based biennial art festival celebrating photography and lens-based art. Since its inauguration in 2010, ArtWorks has contributed large-scale, community-informed, public works of art. This year, ArtWorks has created a multi-faceted project to beautify the Schiff Wellness Center at the Academy of World Languages in Evanston. In Spring 2018, artist Emily Hanako Momohara worked with a team of 5 ArtWorks Youth Apprentices to interview AWL families about their wellness routines and photographed family artifacts. The team met with 25 individuals from 6 families who represent the US, Syria, Tanzania, Iraq & El Salvador. They brought their own family cultures to the project as well, representing Guatemala, Tanzania, Lebanon, and Japan. 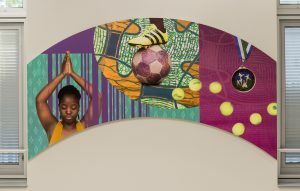 These interviews inspired photo collages that are a collection of images representing a culturally significant display of exercise and food, representing the routines families have to keep themselves healthy and happy. Stories of cultural activities and wellness practices, family photos, and heirlooms were used to create the artworks which are a combination of photography, collage, and textiles specific to the families’ stories. These collages are installed in the waiting room of the REFUGE to welcome patients to the space, helping to foster a sense of pride and belonging. What do you and your family do to maintain your health and wellness? 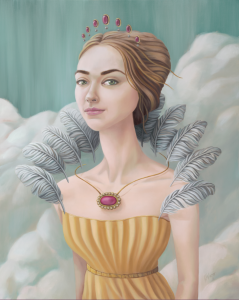 ArtWorks and Olay are partnered to produce “Light as Air” –a public art design contest, that sought submissions from female-identifying artists in Ohio, Kentucky, and Indiana in response to Olay’s new product line, Olay Whips. 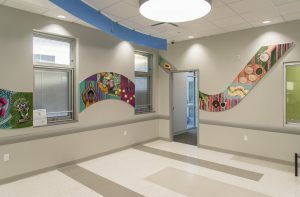 Proposals included both two-dimensional mini mural designs and three dimensional sculptural/installation works, with all original designs inspired by the theme “Light as Air” and the Olay Whips product line. Five winning designs/designers were selected by a panel of local jurors from ArtWorks and Proctor & Gamble. 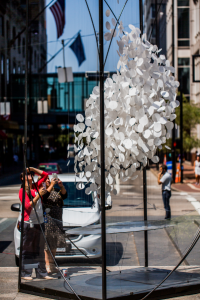 The selected designs were fabricated and installed in areas around Downtown and Over-the-Rhine in Cincinnati, Ohio the summer of 2018. This project provided an opportunity for ArtWorks and Olay to showcase regional talent and promote Olay Whips through interactive public works of art and creative storytelling. Jessica Wolf, “She Is.” Jessica, who is from Cincinnati, used her favorite medium—paper—with ambient or integrated light for her public sculpture. Nora Salazar, “Limitless.” Nora, from Wyoming, Ohio, is a painter, created a work which was reproduced as mini murals for her installations. Shannon Timura, “Feminine Alchemy.” Shannon is from Strongsville, Ohio, with her concrete and fabric sculptures focusing on poseable art dolls and animal pieces. Jess Summers, “Bubbles on Walnut.” Jess, from Cincinnati, is a surreal fantasy photographer. Cassidy Foley teamed up with Nikole Friend to create a computer generated piece, Head in the Clouds.” Cassidy is from Cincinnati and designed a mini mural for her Light as Air inspired piece. 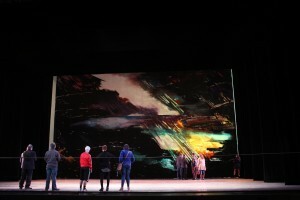 ArtWorks and Cincinnati Ballet are partnered to create new backdrop art for a ballet performance titled “Murder Ballades” in the Spring of 2018. 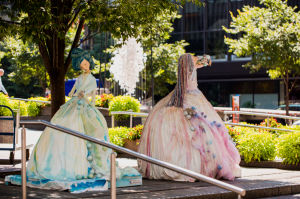 The project provided an opportunity for a Cincinnati-based artist’s vision to be featured as a major focal point in a ground-breaking contemporary ballet. Mental Health challenges affect nearly 20% of the US population, and 75% of those report experiencing stigma related to their condition. Stigma is a form of discrimination – verbal or behavioral – against people with the goal of setting them apart, creating a stereotyped group. In addition to being subject to discrimination, isolation, and stereotypes, prejudice is another negative byproduct those suffering from mental illness face. While mental illness and its stigma affect a broad range of people across demographics, youth are especially at risk. Half of people who experience a mental health condition develop symptoms by age 14 and three-quarters exhibit symptoms by age 24. Young people report suffering higher levels of stigma than adults, and that lack of support has many implications on their capitalization of opportunities, particularly impacting education, economic, and social opportunities. 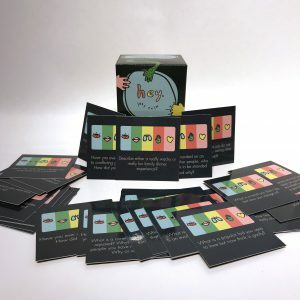 In Summer 2018, artist Kate Tepe worked with the Apprentices to co-design the game based on feedback from 60 engagement participants. The game, Hey. Let’s Talk, is an artistically driven, peer lead, social impact project intending to reduce mental health stigma. The game was developed with the hope that it empowers young people to share and advocate for their needs, ultimately reducing stigma and leading to collective mental health and wellness. In the Fall of 2018, the team played the finalized game with approximately local youth through partnerships with schools and community/arts organizations. Each participant took home a copy of the game to share and play with others. If you are interested in getting a copy of Hey, Let’s Talk, please fill out the request form here. We are accepting orders for one copy per person. If you have a need for a bulk order or have other questions, please contact Megan Rahill at megan@ArtWorksCincinnati.org. Cincinnati has an extensive musical heritage and ArtWorks hopes to inspire people to explore the history. The Cincinnati Music Legend Card Deck project will spark that interest. The project will also allow our Youth Apprentices to gain deeper insight into the entrepreneurial space, while honing their skills in sketching, pen and ink drawing, as well as painting. ArtWorks will work in partnership with Shake it Records to create collector’s card decks to depict Cincinnati’s icons in music. These card decks will then be sold through Shake It Records, ultimately generating pride for Cincinnati’s rich musical history. 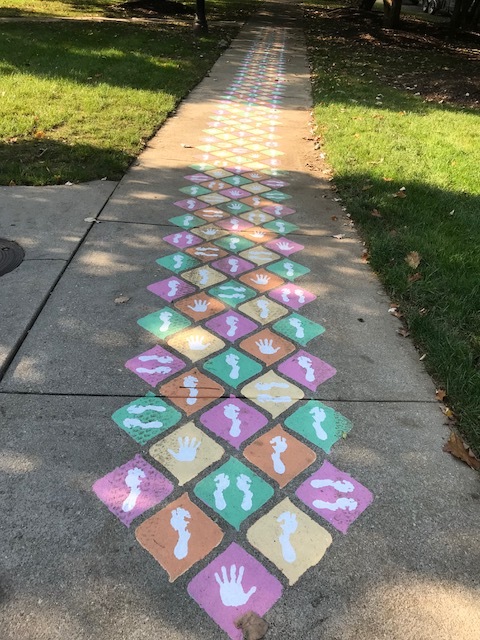 Avondale Development Corporation and go Vibrant engaged ArtWorks to create three activity-based interventions on the sidewalks of Fleischmann Gardens in Avondale. These works are part of a larger effort, and aim to bring color and joy to park users while also promoting health initiatives in the neighborhood. Designed by go Vibrant and Landor, these interventions complement other go Vibrant trail signage located throughout Avondale. 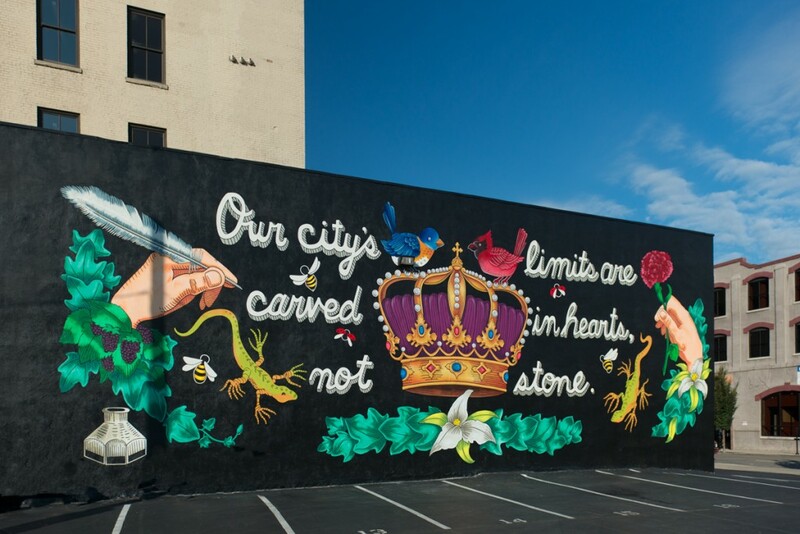 ArtWorks employed a team of two Youth Apprentices and a Teaching Artist who worked in Avondale this summer on the PIVOT mural to execute the project over one week in Fall 2018. Community members and business owners were encouraged to support the project by participating in painting the interventions alongside the ArtWorks team. As a collaborative effort, this project is the first of many similar interventions to be installed in Avondale in the future.